EDINBURGH MONARCHS promoter John Campbell has urged his speedway side to maintain their recent away form at Somerset Rebels tonight – because he wants the chance to have an all-Scottish clash with Glasgow Tigers in the Premier League Play-off Grand Final. Monarchs currently top the table by a single point from second-placed Tigers after last weekend’s action. The Capital outfit did well to recover from a defeat at home by Peterborough Panthers last Friday night by posting two important away victories at Rye House Rockets on Saturday and then Peterborough on Sunday. That eight-point haul puts Monarchs in pole position as they head to the Oak Tree Arena for this evening’s clash with the Rebels and, under this season’s revamp of the play-off system, Monarchs are bidding for a top-two finish at the very least, which would mean that they would advance directly through to the semi-finals as a top seed and would meet one of the four other teams in the top six after they compete in the quarter-finals. If the final league standings end up as they are at present, Monarchs and Glasgow would be the top seeds and would have an excellent chance of meeting in the Grand Final as they would be kept apart in the semis, a prospect that is whetting the appetite of Campbell. “While finishing in the top two might not necessarily be an advantage, it’s in my mind right now that the best possible Grand Final you could have would be ourselves against Glasgow,” said Campbell. 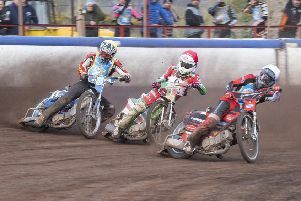 Monarchs were clearly jolted by last Friday’s 45-44 home defeat by Peterborough, but they showed resolve over the weekend to pick up wins on their travels south, especially considering they are still without No.1 rider Sam Masters. The Australian is still sidelined by a hand injury, although he is still travelling with the squad and has been an influential figure in the pits. “My target from last Friday through to Somerset tonight was six league points,” said Campbell. “That was three at home and a single point at the other three venues. We have managed to get eight points already, which was better than I had hoped, but not in the manner I had expected to get them. “Our win at Peterborough was to make up for Friday’s reverse and that was certainly the feeling among the boys. They tried so hard and while Peterborough lost the services of Robert Lambert on Sunday when he crashed in heat ten, you still have to be good enough to be in contention to win, and we were. Campbell told his Aussie ace Justin Sedgmen that he was in the “form of his life” as they left Peterborough after scoring 15 points for the second time in 24 hours. “Craig Cook is just as good,” said Campbell. “They are both almost maximum men right now, and Kevin Wolbert is also going well. If we can get Erik Riss firing from the first race, which will be difficult because he hasn’t been to Somerset before, we have a chance. Tonight’s meeting at the Oak Tree Arena is live on Sky Sports 4. The action begins at 7.30pm.